Earlier this month News Corp. celebrated the three year anniversary of the acquisition of MySpace. Today, AOL does the same for the Weblogs, Inc. blog network they acquired in October 2005. Since the acquisition, AOL says, the Weblogs, Inc. blogs (which include Engadget, TMZ, Download Squad, TUAW, Joystiq, Autoblog and others) have seen worldwide unique visitors climb nearly 1000% (122% annually, on average) and page views rise over 1,500% (154% annually, on average), according to August 2008 comScore Media Metrix. 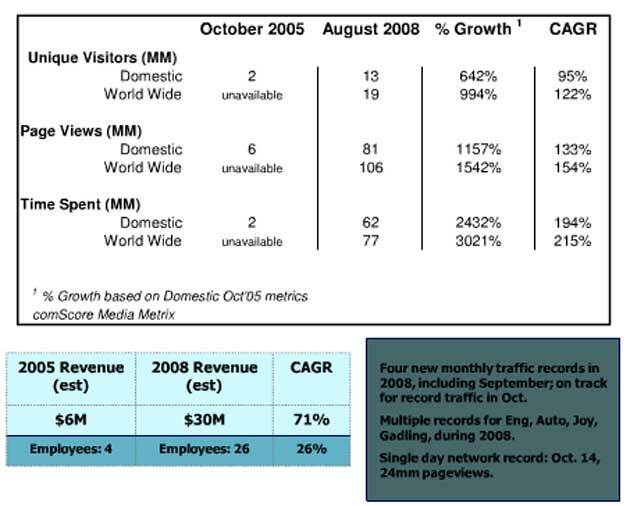 In October 2005, the blogs had a U.S. audience of 1.4 million unique visitors and were generating about $6 million in revenue. Today its 13 million uniques and revenues of about $30 million. In short, it was one of AOL’s better acquisitions. See the screenshots and Powerpoint presentation below for more details.